Combine chipotles, chipotle sauce from the can, cumin, apple cider vinegar, oregano, garlic, salt and onion in a food processor or blender and purée. Pace chuck roast in slow cooker and top with sauce from food processor. Cook on low for 8-9 hours or on high for 4-5 hours, until beef shreds easily. 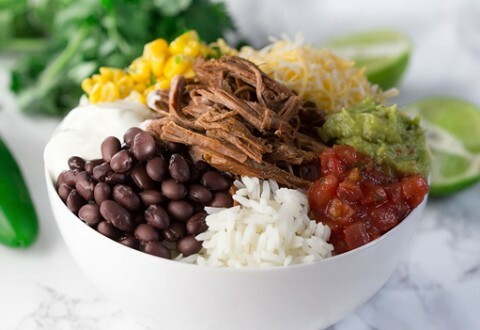 To assemble burrito bowls, place your desired amount of burrito bowl ingredients in a bowl and top with the barbacoa beef. Enjoy!